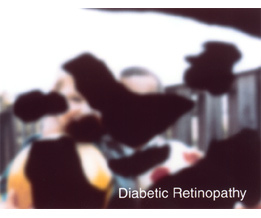 Having type 1 or type 2 diabetes may put you at risk for common diabetes-related eye problems, including cataracts, glaucoma, macular edema, and diabetic retinopathy (damage to blood vessels that lead to the retina), which may lead to retinal detachment. In most cases, diabetes affects the eyes because high blood sugar and hypertension can damage the tiny blood vessels that lead to your retina, causing them to be weakened or narrowed. This may lead to a number of complications, from blood getting into the vitreous (or gel-like area) of the eye, to the retina becoming detached. These symptoms are difficult to detect so be sure to have your eyes checked regularly if you have diabetes. Preventive measures are the best ways to avoid eye problems associated with diabetes. Keep your blood glucose and blood pressure as normal as possible: high blood sugar and hypertension are high risk factors for damage to the tiny blood vessels in the eye, which is the starting point for more serious complications. Making sure your blood glucose and blood pressure are where they need to be can help you stop problems before they start.